It’s been a pretty quiet week so I thought instead of doing a Friday Five I would talk about how we’re dealing with the closet issue in our bedroom. 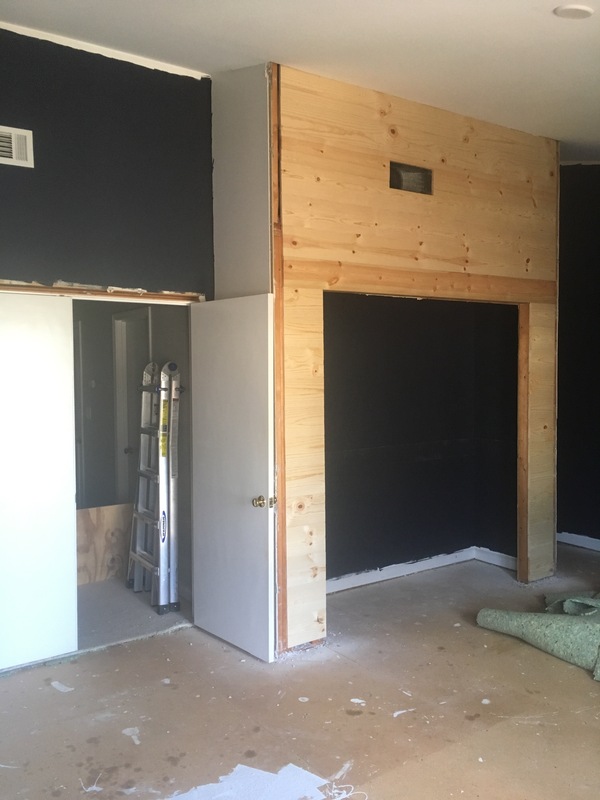 Like I mentioned in my last post, we can’t get rid of the closet in our room because it’s structural so we decided to make it into a feature wall instead. Don’t get excited, Joanna Gaines is not coming to my house to create a feature wall. Well ya know, unless she wants to. Joanna? Call me, girl. SHIPLAP. Yep, we’re being super trendy and installing faux shiplap using tongue and groove pine boards we bought at Home Depot. I’m going to go with a big dose of honesty here and say that we landed on this idea not because we’re dying to jump on this bandwagon but because nailing up these boards is a million times easier, faster, and less messy than rehanging drywall. We are lazy people and we will not deny it. I honestly never thought I would install wood paneling in our house but since our entire living room is covered in it we thought it would tie in nicely. Here’s an in-progress photo I took yesterday. We decided after we did the front that we’re going to wrap the sides, too and then we’ll paint it all white. So that’s creative solution #1. Keeping the closet means we have less options for furniture placement so creative solution #2 involves where to put the dogs. Our original plan was to build a piece of furniture that would double as dog crates and a console table. I had been thinking about putting this piece on the closet wall anyway so I came up with the idea to build in the bottom half of the closet for the dogs and top it off with a tabletop. Our TV will go here and potentially one of our record players. We’re also talking about installing shelving as another area to store books/vinyl/etc. Here is a very rough idea of where we’re going. 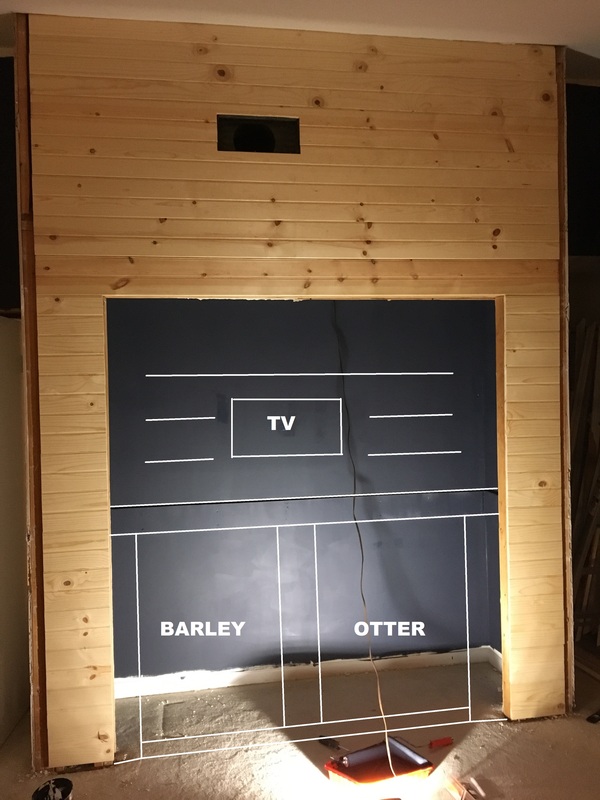 The top will probably be bar height which I realize sounds a little crazy but I want to keep the doggy area as open as possible. I thought the closet was going to be too narrow for this to all work but it turns out it’s only about an inch narrower than the crates the dogs are used to sleeping in. They’re really only in their crates at night (though that might change with our new bed) and occasionally in the evenings if we go somewhere. We typically let them have free rein of the house while we’re at work unless they eat a chair or something and then they spend the next day crated. We don’t have any real plans drawn up for this project yet but I was kind of thinking about it while trying to sleep last night and I think I have an idea. For now though we’re trying to focus on finishing the floors so we can at least move back into the room. Oh crap, that reminds me I still need to order baseboards. We won’t really have time to work on the room for most of the weekend but I’m hoping we can make a lot of progress on the floors tonight. Kyle pulled up all of the tack strips and staples the other night and last night we vacuumed, hammered popped nails, added a few screws in the squeaky areas, and put down the underlayment so the next step is to lay the flooring!